Goal is to prepare Nebraska for action by extreme animal rights groups. Animal rights groups like the Humane Society of the United States are increasing efforts to tighten the screws on animal agriculture. And it's not out of the question HSUS will seek a ballot initiative or legislative action in Nebraska, based on its success in states like Ohio and California. This activity by "extreme animal rights groups" has prompted the formation in Nebraska of a new organization called We Support Agriculture. The five organizations forming WSA officially launched their effort at Husker Harvest Days Tuesday, Sept. 13, after first making presentations that day in Omaha and Lincoln. WSA also announced the launch of its website: www.wesupportag.org. 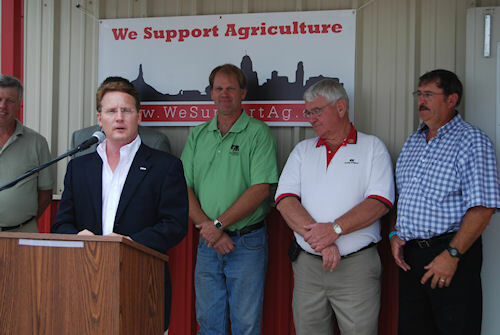 Pete McClymont, president of the newly formed We Support Agriculture, speaks at a press conference during husker Harvest Days. WSA's purpose is to educate Nebraskans about modern agriculture methods and also to defend agriculture against attacks and misinformation about modern technology used to raise livestock, according to Pete McClymont, WSA president and vice president of government affairs with Nebraska Cattlemen. "Nebraska's farmers and ranchers are caring people who know how to care for their animals properly," says McClymont. "They go to great lengths to protect their animals from disease, predators and the harsh Nebraska climate while feeding their neighbors and the world." WSA leadership consists of following Nebraska agriculture organizations: Nebraska Cattlemen, Nebraska Farm Bureau, Nebraska Pork Producers Association, Nebraska Poultry Industries, and the Nebraska State Dairy Association. WSA is also supported by the Nebraska Veterinary Medical Association and the Nebraska State Chamber of Commerce. In addition, 12 city chambers of commerce in Nebraska have passed resolutions supporting animal agriculture. "All of these groups fully understand the economic impact of animal agriculture in our state, McClymont says. "Nebraska agriculture is vital to our state's economy and the Nebraska way of life," McClymont says. "One out of every three jobs in Nebraska involves food production, manufacture or delivery. Nebraska agriculture generates more than $15 billion in economic activity every year. Livestock alone accounts for more than $7 billion in economic activity. Nebraska agriculture helps fund Nebraska schools, roads and local governments. This industry is worth protecting from attacks and misinformation by outside groups who want to radically change--or in some cases eliminate--agriculture as we know it in Nebraska." There has been increased activity across the country by animal rights groups who have an agenda to make Americans eat less food originating from animals--such as meat, eggs, and dairy--by instituting "hostile" regulations that will increase the price of these foods and make them much more difficult to produce, says Jay Rempe with the Nebraska Farm Bureau. This negatively affects consumers by inflating the cost of food and limiting the availability of nutritious food choices for their families. WSA's goal is to defend agriculture against this extreme agenda, he adds. Animal rights groups that are targeting animal agriculture, in addition to HSUS, are the People for the Ethical Treatment of Animals and the Animal Legal Defense Fund. Rempe says HSUS annually brings in $100 to $105 million a year, but less than 1% is given to local animal shelters. "Twenty-two million of that amount is spent on fundraising activities, he says. "We need to be ready here in Nebraska," Rempe says.